Instructions: Prepare a 5 x 7" white card base. Layer with a piece of Tulip Time paper 1/4 inch smaller. 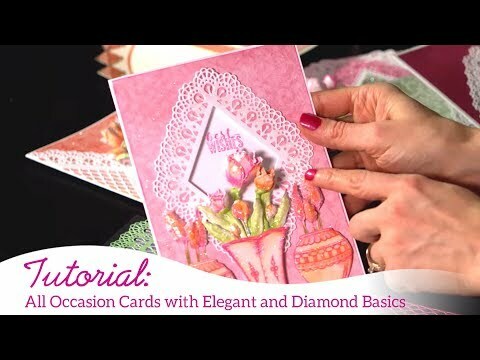 Cut a Lacy Diamond pattern out of white and then the center of the Tulip Time paper, topped with another piece of white with the very center of the die, use small foam dots on the back and adhere to card. Use the White Pigment ink and stamp the Oakberry Lane flowers and leaves on vellum. Heat set with the Bridal embossing powder. Color on the back of the Vellum with the Vermillion and Emerald Green inks. Use the matching dies and cut out. 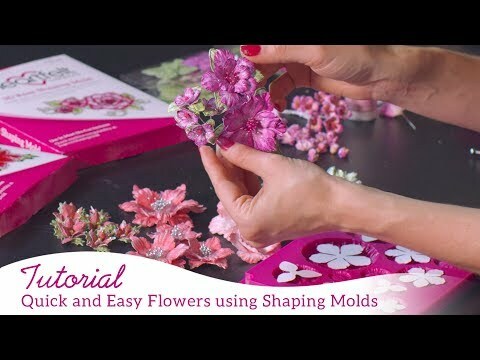 Glue 2 flowers together. Use the Groove Golf tool and punch a hole in the center. Add the Stamens and set with the heat gun. Adhere to the card. Use the Ticket & Tag die and cut out one of the tags from the paper collection, add to card to finish.